Luke Beckham trying his luck at the Dream Machine at Walpole Mall. Now it’s the favorite place of my youngest grandchildren. They are 11, 9, and 5, one girl and two boys, and though they live in New York City and are exposed to theater and art and music and history and everything else you can possibly imagine, it’s the Walka Walka Mall, which, when the three of them land on my doorstep, they clamor to visit. The mall dazzles them. Especially 9-year-old Luke. It’s not the entire mall that lures, of course. It’s the Dream Machine that’s the draw, a small arcade that’s a throwback to the 1950s. It’s got all the bells and whistles of a yesteryear arcade, bright, flashing lights, coin-operated machines that clink and clatter and spit out small yellow raffle-type tickets, which you collect and then trade in for candy and prizes, which wouldn’t look so grand anywhere else, but are somehow transformed here. It’s got Skee-Ball, Wheel-’m-In, big metal claws that grab small stuffed animals or rolled up packets of tickets, a bowling game, a basketball game, and a game in which you get to pretend to drive. Luke’s favorite is Whack n Win, a game of strength you used to see at carnivals, where a guy would take a mallet and swing it over his head to hit a pad that would fly up and ring a bell at the top. You hardly ever heard that bell ring, except in movies, because it took a massive human with massive arms to propel that pad to the top. But this new, computerized game is different. The goal is not only to get the ball to the top and ring the bell, but not to exceed the top, to apply just the amount of strength to trigger the bell, and not a bit more. 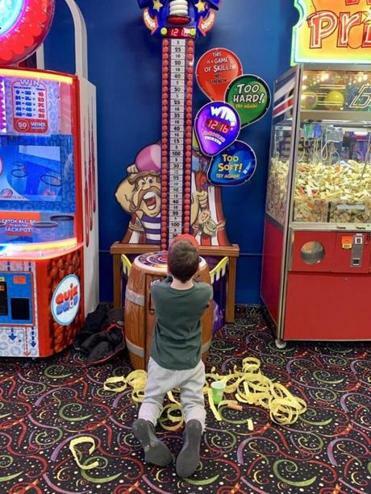 Last summer, on one of his first tries, Luke got lucky, and the machine squealed and squawked, hooted and howled, and lights flashed and whistles blew and hundreds and hundreds of small, yellow tickets poured out of the machine and onto the floor. And Luke was hooked. He went home, back to New York, and hoarded his quarters, tucked them in a pouch reserved for his next visit. He watched that pouch expand. He watched that pouch grow fat. And when the time came, the Friday after Thanksgiving, he was jonesing for an encore. We got to the mall in time to see the Dream Machine open. We watched it lift its steely gates and welcome us. Lights flashed and whirled. Machines jangled. There were no other customers. We were in paradise all by ourselves. Megan and Euan raced to the back of the store. Luke stopped a short way in. There was the Whack n Win. He never walked any farther. Luke fed that machine, once, twice, over and over and over and over. He took his time between tries, assessing what he had done, controlling the force he used. “Too soft!” “Try again!” “Too hard.” “Almost this time.” Did I hear these words, did the machine say them? Or did I only imagine this? We tell kids all the time not to give up. Never to quit. Keep at it and you’ll succeed, right? Except here. Except here in this place. His dad talked to him. Told him how lucky he’d been to beat this machine even once. Told him that the games are programmed to win. Told him that it was time to move on. And Luke, with his eyes wide, still innocent about the world of profit and loss, said, “Yes, but . . . “ certain that if he tried just one more time, he would win. He didn’t. But he didn’t cry, either. He traded in his tickets, not the thousands he’d anticipated, but more than enough for a small bag full of candy, which he shared with his sister and brother. I worried when Adam was little that the arcade would turn him into a gambler. It didn’t. It turned him instead into an educated consumer. When Adam realized he could get more bang for his buck — more candy and more rubber ducks for his dollars — at a regular store, the machines lost a little of their lure. Or maybe it wasn’t just knowledge that showed Adam that all that glitters is not gold. Maybe it was time, too. Adam grew up. He says Walpole Mall now. Luke and Megan and Euan will grow up, too. But until then, the Dream Machine at the Walka Walka Mall still beckons. Beverly Beckham’s column appears every two weeks. She can be reached at bevbeckham@gmail.com.